Low-profile mechanical keyboards are the next trend, it seems. Just last month we reviewed Roccat’s Vulcan 120 Aimo, the first keyboard I’d seen to combine laptop-style keycaps with full-sized mechanical switches. It was eye-catching, to say the least. 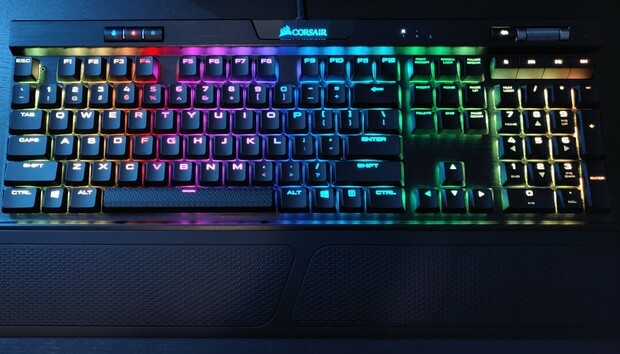 Now Corsair’s got its own version, the K70 RGB MK.2 Low Profile Rapidfire ($160 on Amazon). Thankfully, the keycaps are a lot shorter than the name. Let’s dig in. This is the first Corsair K70 model we’ve tested in a while, but you’d barely know it at first glance. Not much has changed in four years. Oh sure, at some point Corsair got around to fixing its busted RGB controller, and the CUE software suite is marginally better these days. But from a design standpoint? The K70 is a rock, immutable. Thus the Low Profile version features the same exposed brushed metal backplate as its “high-profile” predecessors, with the keycaps raised to better show off the lighting. Barely raised, though—and that’s the most surprising aspect of the K70 Low Profile. If you take a look at Roccat’s Vulcan 120 Aimo, half-sized keycaps were clearly an aesthetic choice. Lighting is key, with the translucent keyswitch casing shining brightly out from under each cap like a field of luminescent mushrooms. It looks weird at first, and feels even weirder, but the design grows on you. Corsair’s K70 Low Profile is different though. These aren’t half-size keycaps popped on top of normal Cherry MX switches, like I expected. Instead, Cherry’s designed a different switch entirely. Building on the work it did with the MX Speed switch a few years ago—called MX Silver when used by third parties—Cherry’s created a Low Profile version with a completely different footprint. It barely even looks like a Cherry switch. Sure, you’ve got the iconic cross-shaped stem in the center, but that ring of support plastic around the outside changes the footprint substantially. Appearances are deceiving though. Cherry said its goal was to recreate the standard MX typing experience in a smaller switch, and as far as my fingers are concerned it’s mission success. Typing on the Low Profile MX Speed feels remarkably similar to the full-sized version, with a few minute (practically imperceptible) differences. The full-sized MX Speed features a travel distance of 3.4mm, an actuation of 1.2mm, and requires 45 grams of force. The Low Profile MX Speed sits at 3.2mm, 1.0mm, and requires the same 45 grams of force. All this in a switch that’s 35 percent smaller than its full-sized predecessors. It’s an impressive feat of engineering, and I’m curious whether we’ll start seeing them on laptops soon. Until now, mechanical keyboards have been primarily a gimmick in oversized laptops like MSI’s GT80 where space could be spared. A Low Profile MX switch might make inroads. But the K70 Low Profile is a desktop keyboard, which makes this an ergonomic choice. Perhaps it was inevitable. With so many people using laptops day-to-day, it’s only natural some would prefer the flatter profile of a chiclet keyboard while still wanting the crisp and clean keystrokes of a mechanical. The K70 Low Profile doesn’t feel completely flat like the Roccat Vulcan Aimo 120, but it’s close. There’s still a millimeter or two of height variance between rows, which helps recreate the desktop typing experience, but it’s slimmed down enough to provide the speed I associate with a flatter laptop keyboard. Ergonomically, I think I prefer the higher arch of a full-size desktop keyboard, but I’ve been surprised at how quickly my fingers fly across the K70 Low Profile. It’s completely down to personal preference though. As I said, the Roccat Vulcan Aimo 120 was mostly a bold design experiment. The K70 Low Profile is not. The same sliver of light peeks out from the bottom of each switch, and if anything, the overall effect is dimmer than some of Corsair’s other keyboards like the K95 Platinum. And in most respects, the K70 Low Profile is identical to its standard-switch peers. The same block of media controls resides in the top-right corner, with the usual best-in-class volume roller at the top. I still prefer Corsair’s smooth and intuitive roller to the increasingly common “Radio Dial” setups we’ve seen on recent keyboards like Razer’s Huntsman and Roccat’s Vulcan Aimo 120. There’s USB passthrough on the rear, plus a block of buttons in the top-left for profile storage, backlight brightness, and game mode. Then there’s the wrist rest. This is the one area where I think Corsair’s quickly falling behind its peers. The past year or two, we’ve seen Razer, Logitech, and others pack in plush, padded leatherette wrist rests with top-end keyboards like the BlackWidow and the G513. Corsair’s soft-touch plastic isn’t really cutting it anymore. It’s comfy enough—definitely more comfortable than you’d expect from unpadded plastic. But if Corsair’s going to command a premium price it needs to stay competitive on all fronts, and right now it’s losing the wrist-rest war. That’s a small quibble though. Overall the K70’s build quality is still among the best in the business. Cherry’s Low Profile keys aren’t quite as time-tested as its standard switches, but the company has a reputation for quality and it certainly feels solid enough after a few weeks use. We’ll keep you updated if rattling or double-press issues start popping up, but for now this seems like another solid addition to Corsair’s lineup. If you’ve been looking to recreate a laptop typing experience on a desktop, the K70 Low Profile is certainly a better choice than the bevy of rubber dome and scissor switch keyboards you’d have to choose from a few years back. I’m not sure whether Low Profile MX switches will displace standard Cherry-style designs among enthusiasts, especially fans of the tactile Cherry MX Blues, but it’s an interesting alternative and could open up a whole new market for mechanical keyboards. Time will tell. For now, all I can say is the K70 RGB MK.2 Low Profile Rapidfire makes a successful foray into an emerging trend. Expect even more to follow—both Ducky and Cooler Master have announced Low Profile MX keyboards for the near future.